Single Ply Roofing Membranes Provide Exceptionally Lightweight Protection. When you first start searching for your next commercial roof, you’ll find an extensive variety of commercial roof solutions to pick from. Among your most efficient options are single ply membranes, which we will discuss here. Created to be a solitary layer over the top of your roof, these accurately named membranes provide some exceptional defense for your roof. You will have several solutions to choose from, as well as a variety of budgetary options to review. Our team is happy to work with you to find your ideal roofing solution. To ask for an estimate for single ply roofing in Texas, Louisiana, and Mississippi, give the crew a call now at (833) 200-0571! We are specialists in roof solutions for home, businesses, and everything in between, so you can count on us! As with all roof types, you can expect different roof kinds to offer different benefits, but almost every single ply membrane option can promise reliable leak defense, flexibility, and UV damage resistance. The most commonly picked option from our stock of single ply membranes is the EPDM option. Due to the flexible as well as lightweight nature of this polymer, EPDM roofing is also recognized as rubber roofing. Rubber roofing is sold in large pieces, and those large pieces often allow us to apply the roof in a single piece, which reduces the amount of seams on the roofing. 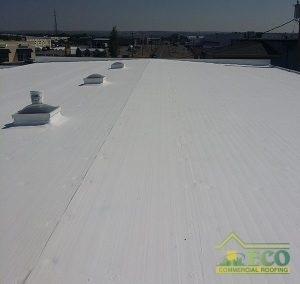 Other common favorites are PVC and TPO, both of which we supply here at ECO Commercial Roofing. As thermoplastic membranes, (as opposed to EPDM, which is a thermoset membrane), both TPO and PVC defend against leaks with super-strong heat-welded seals. PVC is one of the most ideal options on the market for single ply membranes, and provides better protection than EPDM. When it comes to the longevity and safety of your business, invest in a quality roofing system that will last for years to come. If you’re interested in improving your commercial roof with single ply roofing in Texas, Louisiana, and Mississippi, be sure to give us a call now at (833) 200-0571. After a long time in the business, our quality contractors understand the exact technique to ensure your roof membrane serves you well for years to come. At ECO Commercial Roofing, we work diligently to be the single ply roofing company you can depend on. EPDM EPDM roofs, also known as rubber roofs, are very durable, and resistant to any damages from the weather. PVC PVC roofing is one of the best options on the market for single ply roofing and provides exceptional protection. TPO TPO roofs are a happy medium between PVC and EPDM and are a very affordable option for single ply membranes. Vulcanized Roofing Vulcanized roofing materials are sealed prior to installation, making them very durable and resistant to damages.